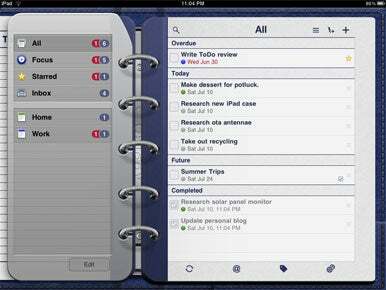 Todo for iPad, a $5 productivity app from Appigo, oozes with awesomeness. Much like its iPhone counterpart, Todo looks slick, it functions intuitively, and is packed with features that you don’t need to mess with if you’re not interested, but can easily avail yourself of if you’re a true power user. The first thing you’ll notice when you launch Todo for iPad—really, you won’t be able to miss it—is that the app simply looks great. There are times when it doesn’t make sense for an app to emulate its real-world counterpart, but Todo’s recreation of a spiral-bound notebook works beautifully. The default theme is a blue faux-leather notebook, but you can choose from a variety of other themes or even purchase an in-app upgrade for an even fancier look. I’m quite content with the almost photo-realistic default theme. Taking to Tasks: Todo can group, filter, and sort your tasks in numerous ways—and they all look quite good. When you tap on the Settings button, the main screen “flips over” to the left, revealing a cleverly iPhone-sized settings panel, tucked into the notebook’s virtual back pocket. I’ll dive into the settings more deeply below, but my one complaint about the notebook look Todo uses is that it’s so book-like that I expect it to behave like the popular crop of e-reading apps: I want to be able to swipe back to the main “page,” but that doesn’t work. You can tap at the left edge of the screen to get the page to flip back, but I frequently found myself swiping unsuccessfully. Todo’s main screen, unsurprisingly, lists all of your currently active tasks. The app’s developers wisely put effort into making the process of adding new todos simple. 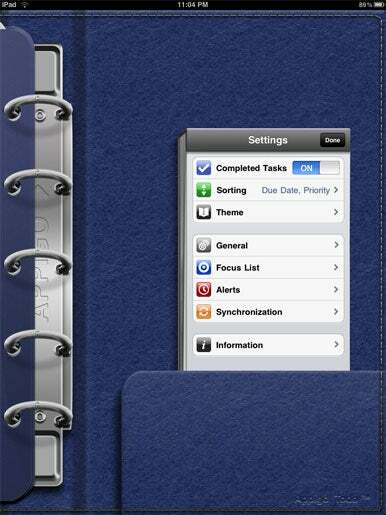 You can add multiple tasks consecutively with minimal fuss, if you don’t mind creating them without any extra details. (Since I often experience sudden bursts of productivity-centric inspiration, I really appreciate this feature.) When you add one task at a time—or when you edit existing tasks—you can tweak an exhaustive amount of options. Oh, the myriad options: When you create a new task, it can be a normal one, a checklist, or a project. You can choose to start the task, add notes to it, or assign it a due date and/or time. (Somewhat oddly, the default due date is always “today,” which while inspirational, doesn’t always mesh with my personal reality.) Beyond that, you can adjust recurrence and priority level. And then you can categorize your new entry—by tag, by list (eg, “Home” or “Work”), or by context. I can’t imagine someone needing to use each categorization method, but it’s nice that whatever your preferred approach, Todo should be able to handle it. Phoning It In: The Settings screen in Todo resembles a miniature iPhone tucked into your virtual notebook’s back pocket. Even more importantly, you can view your tasks in Todo any way you want to—sort tasks by due date and then priority, or the reverse, or choose to go alphabetically instead. And, of course, you can filter by any of those tags, contexts, or lists you set earlier. In short, Todo behaves just the way you want it to—however you define said wanting. The app adjusts gracefully as you rotate between portrait and landscape. Its badge icon is fully customizable, and can reflect your total number of overdue tasks, or your due and overdue tasks, and so on. The app can integrate with TextExpander, and can sync with both the developer’s own tool (Appigo Sync) or the Toodledo web service. Todo is painfully well thought-out and implemented, and enough of a delight to use that you’ll remember to keep checking in to make sure you’re genuinely getting your stuff done. I’ve tried numerous iOS task-management apps, and none to date have satisfied me as much as Todo for the iPad.